So normally, I try to avoid posting swatches of polishes that are extremely hard-to-find. I know that personally, I hate perusing blogs and seeing a polish I love and then finding out it's long-discontinued or a super rare limited-edition. I like to be able to go and purchase something once the lemming fire has been lit. Probably like most of you, my most recent lemmings have been for indie brands, despite my claim that I've given up on indies. LOL. My general rule on posting indies is that if I have the indie polish, I will post a picture of it, provided that at some point, it will be restocked. However, I had to make an exception for this baby. Isn't she gorgeous? This is one coat of Dollish Polish Toxic Avenger over 2 coats of Deborah Lippmann Stormy Weather. You may remember that my entry to last year's Rescue Beauty Lounge Fan Collection contest was an oilslick polish. I based the entry on a picture that I took the day after Christmas, right after we had our first-in-a-million-years white Christmas. An oilslick polish has been my dream for years and I was inspired by the picture. I wasn't even planning on entering the contest and then I saw that gorgeous swirly rainbow in the middle of a dirty gas station parking lot, and I couldn't help myself. Unfortunately, for whatever reason, Ji Baek didn't feel the same as I did and my idea wasn't selected as one of the finalists. Boo. After my submission was rejected, I tried to find a polish that hits all of my check boxes when it comes to my dream "oilslick". Some have come close, but so far, I had not found a polish that has the same feeling as my inspiration picture. In fact, I pretty much decided that it was an urban legend.. a mythical being, and given up. I did think that it was too light to be my perfect oilslick polish, but a base of dark grey fixed that. I opted to layer it over my new favorite grey creme, Deborah Lippmann Stormy Weather. Also, because I have a mini bottle (and this stuff is like liquid gold, IMO), I will probably continue to layer it when I wear it. Unfortunately, it was a limited edition polish and I didn't know if Dollish Polish was going to ever restock it. Then, I saw it listed as the "mystery polish" when Dolly re-opened her store last week. I added it to my cart quick as a bunny, and I am so, so, so happy I did. I think I could stare at my nails for a week and not get bored. As I mentioned, Toxic Avenger is a LE polish, and while Dolly is continually restocking her store on a relatively frequent basis, I'm not sure if Toxic Avenger will be making a come-back. I hate showing you a polish that requires you to make deals with Rumpelstiltskin to acquire, but I just couldn't help it. Please forgive me for any lemmings this may have created. 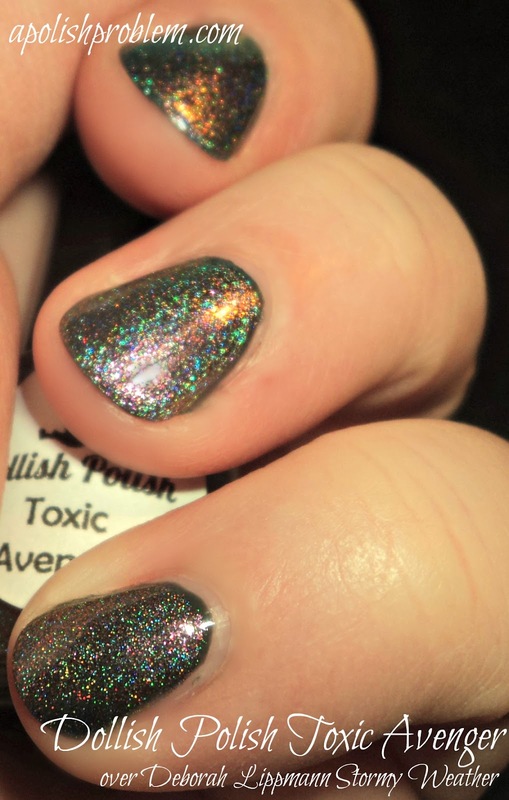 Dollish Polish Toxic Avenger was purchased by me. The above links link to a post on this blog and Polish Galore and are not affiliate links. Swoon, swoon, swoooon. I own this and it is my favorite polish, EVER. That is how much I love it. And I got it as a RAOK, how sweet is that? OMG that is one stunning polish! wowza!!!! so amazing those sparkles are!!! That polish is beautiful...Your article was great. Check out my page...for great nails without polish! I love doltish they are hard to come by. I hate to say it bit I really did not like the last line. Sad that we lost NerdLacquer now we might lose Lynderella. I' gonna need to follow doltish tweets because I need to get me some of that polish. Oooooh, so gorgeous!!! Wish it was more readily available! oh hai. <3 I still love your oil slick inspiration. This is very pretty-- too bad it's apparently LE! I'm wondering-- have you looked at Lex Cosmetics Seashell? (http://www.lexcosmetics.com/stories.php#seashell). It's a grey/black/brown scattered holo, and might have that oilslick quality you're looking for. Good blog. Your nail polish color is too cute. Thanks for sharing information.